Many users of sponge rubber products for sealing are unaware that UL guidelines dictate that when adhesive is applied to sponge rubber the chemistry has been changed. Essentially, this creates a new product which must be tested and pass UL standards. 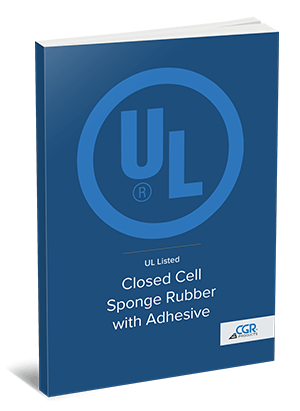 To help solve this issue, CGR Products has three sponge/adhesive combinations that are listed to UL JMLU2 standards and are suitable for UL50E applications. Below are our three combinations to help you identify the best solution for your application. Armacell Neoprene blend sponge with 3M acrylic adhesive. Monmouth Neoprene blend sponge with 3M rubber based adhesive.